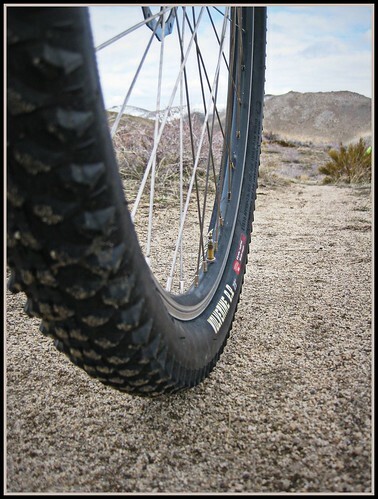 Back in November of 2009, I wrote about my initial impressions of the 29″ (29×2.2) Wolverine tire from Wilderness Trail Bikes HERE. I’ve had over a year on the Wolverines now, using them as a front and rear tire, and riding them on all sorts of terrain. Here are my final thoughts on the tire. 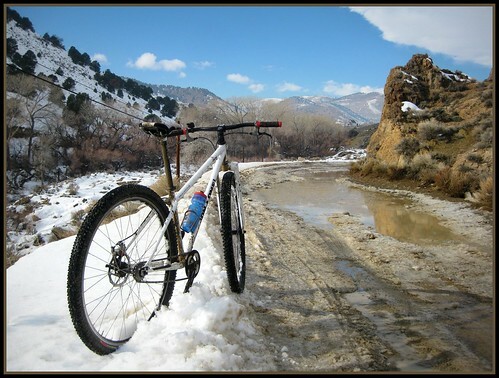 Throughout the year, I got to try the Wolverines in snow, mud, sand, hard pack, and asphalt. 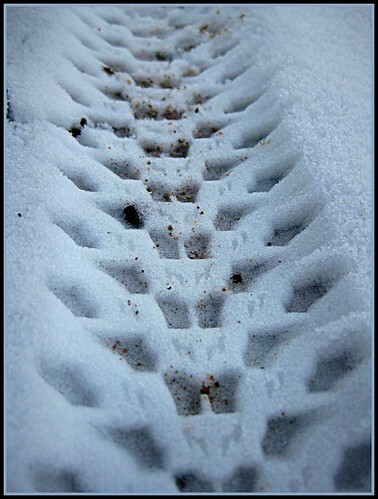 These tires handled all these conditions well, making them a great choice for all-terrain applications. The tread pattern of the Wolverine provides plenty of bite no matter what angle the bike is at, from straight up, fully leaned over, and everywhere in between. The tire feels very predictable and confidence inspiring all the way through a turn, progressively biting harder the further you lean the bike over. The squarish profile of the tire further enhances contact with the ground, especially when combined with lower pressures. These same qualities help stop your bike quick when it’s time to brake. The Wolverines do pretty well on the asphalt as well. 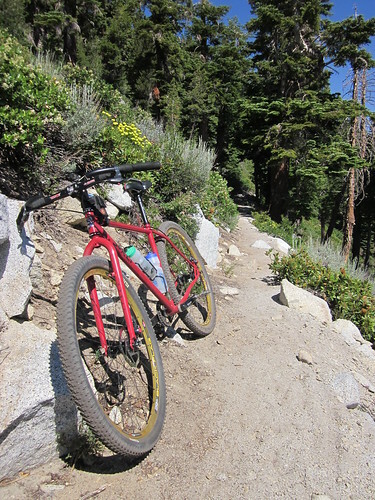 I frequently ride my mountain bike on the road to the local trailheads and around town, so having a versatile tire is important to me. You can descend and corner with confidence whether on high speed road descents or just zipping around the city streets. The moderately spaced tread of the Wolverine allow the tire to roll smoothly without the bumpy knobby feeling of a more openly spaced tread pattern. Because of this, the tire feels lighter than it is. 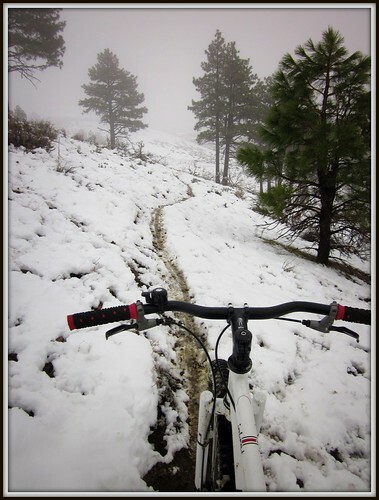 The tread is still aggressive, but the knob spacing works well in all conditions, whether riding through snow, mud, sand, hard pack, or transitioning through a combination of these terrains. My test tires weighed in at 805 grams and 840 grams. 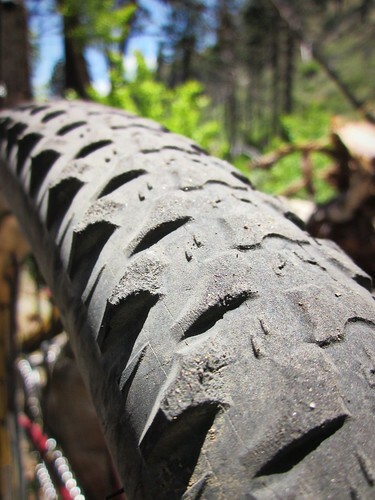 This takes them out of the race tire arena, and puts them into the trail riding category. You may not set record hill climb times with the Wolverines, but it’s still a tire that you can pedal on all day epic rides comfortably. Light enough for climbing performance, large enough for plush comfort, aggressive enough for varying conditions. The new advertised weight is 774 grams, so it looks like WTB was able to shave a little weight off since the first production run. WTB mentioned that they were surprised at the initial weight as well. Running the tires tubeless also helps get the rotating mass of these big hoops down. I began this review back in the Fall of 2009, and I’ve ridden these tires every week since then. 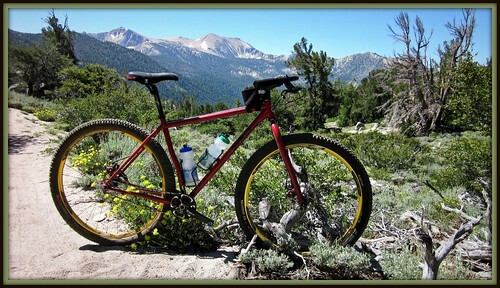 I used the Wolverine as a front tire for several months as I wore out a couple rear tires. I finally ended up moving the Wolverine to the rear to get a “little bit” more use out of it, but I’ve ended up riding it an additional half a year! I can honestly say the tire is done now though. It still corners great, but the center knobs are worn down to the point where it’s slipping on climbs and during braking. It was a great value to get this much use out of a tire. Especially one that works well as a front or rear application. Although these tires are not part of WTB’s tubeless tire lineup, I’ve ridden them tubeless for over a year with no problems using Stan’s NoTubes Sealant. The tires sealed easily, held consistent air pressure for several days, and have never once had a puncture. They were mounted on On One standard rims for the first part of the test, then Sun Ringle Black Flag tubleless ready rims for the remainder of the test. Dropping extra rotational mass by going tubeless was noticeable. It got the weight into that sweet spot where the wheel accelerates quickly without feeling sluggish. I typically ran the tires at 25psi in the front, and 30psi in the rear. This flattens the tires out nicely for optimal traction with no fear of pinch flats or rim damage. As a front tire, the Wolverine is fantastic. It’s a perfect blend of traction, low rolling resistance, large volume, and durability. It’s not as plush as the big WTB Weirwolf 29×2.55 LT I’m running now, but the Wolverine definitely has superior traction. As a rear tire, the Wolverine may be overkill depending on your conditions. With their already larger footprint, 29 inch wheels are not short on traction. 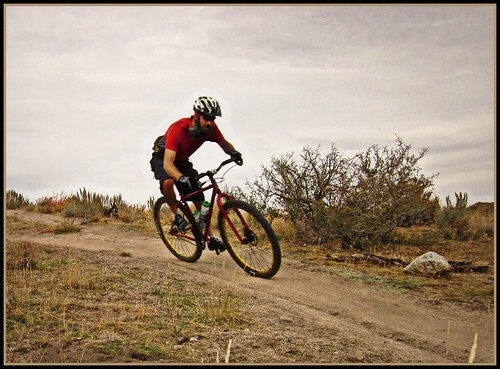 The lightly treaded 29″ WTB Nano Raptor I enjoyed last spring and summer hooked up well in most situations, and saved me quite a bit of rotating mass. Switching to the Wolverine in the Fall slowed me down a bit, but it was nice to have more traction in the deep Fall sand and the snow and mud of Winter. Light fast tires don’t buy you much if you’re spinning out when you need traction the most. I will definitely purchase more Wolverines in the future, especially for front tire applications. They hook up in a wide variety of conditions, roll well, are durable, and weigh in at a reasonable weight for all-around trail riding. Additionally, the large volume casing provides a comfortable ride, floats over the sand and other soft surfaces, and protects the rims well. Highly recommended! 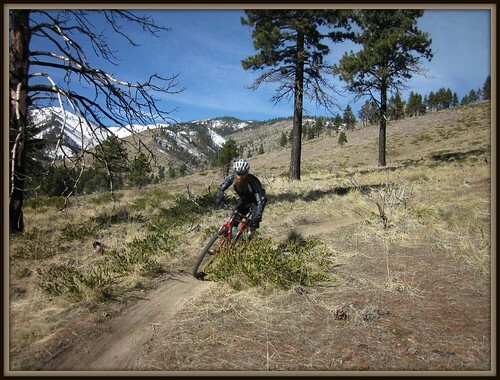 More info at WTB (Wilderness Trail Bikes). Disclaimer as required by the FTC: This product was given to BikeCarson.com at no charge for test and review. We were not paid or bribed to do this review, and will provide our honest and personal views throughout the entire process. As faras WTB as a whole, your findings have been exactly opposite of mine, although the Bronson has caught my eye. Which tires have you tried Quinn? Been running Weirwolf 2.5″ on my 26 inch bikes for years as a front tire. 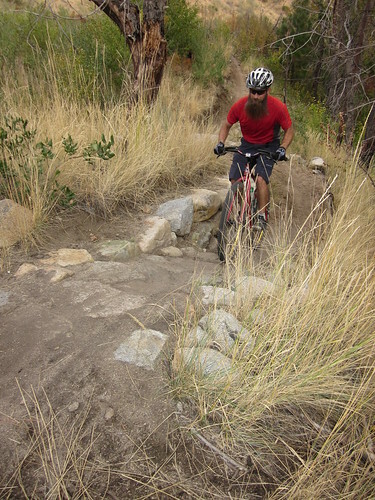 Although as our trails become more developed, it’s probably too big now. I’ll switch to a lighter tire at next change. Another tire that is popular with me and my riding friends is the Mutano Raptor 2.4. Probably the lightest big volume tire available. Always been one of my favorite rear tires. The Nano Raptor I had last year was super light and fast, but I wore through it pretty quick. I’ve taken my favorite tires to other places out of the area and was surprised to find they didn’t work as well. I suppose Reno is different enough from Carson…especially the Peavine area. The Bronsons have caught my eye too. Expect a test of those soon.